Any parent would be outraged if their child was exposed to violence and crime. Any community would consider this to be unacceptable. Should we be concerned about the risks that young people who are homeless face? 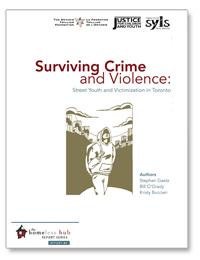 In our report, “Surviving Crime and Violence”, we explore the relationship between youth homelessness and criminal victimization. Our research highlights the degree to which the lives of young people who are homeless are characterized by high levels of crime and violence. This report, prepared for Justice for Children and Youth, was led by Stephen Gaetz (York University) and Bill O’Grady (University of Guelph). Two hundred and forty four homeless youth in Toronto were interviewed in 2009 about life on the streets, including their experiences of criminal victimization. While street youth are often portrayed in public discussions as dangerous, threatening and delinquent, this new research highlights the degree to which it is street youth themselves who are clearly vulnerable to crime and violence. The findings of this research reveal that street youth are victimized frequently, in large part due to the vulnerabilities that young people face when they are homeless. Particularly concerning are the findings which indicate that interventions to this victimization are not being effectively addressed by the criminal justice and shelter systems or by other professionals involved in the lives of street youth. We suggest that if the levels of violence and other forms of crime found in this study were being experienced by any other group of youth in Canada there would be immediate public outrage and considerable pressure for government to take action. Street youth deserve the same level of attention in responding to and preventing crime and violence that any other group of Canadian citizens are entitled to. Such attention is needed so that street youth have an opportunity to move forward in life. Download Adobe Digital Editions or the Stanza ePub reader in order to read the chapters on an iPhone, eBook reader and other handheld devices. Listen to Stephen's interview with CBC Metro Morning.